How Do Oil Spills Affect Sea Turtles? JUNE 16, 2016 — Sea turtles: These beloved marine reptiles have been swimming the seas for millions of years. Yet, in less than a hundred years, threats from humans, such as accidentally catching turtles in fishing gear (“bycatch“), killing nesting turtles and their eggs, and destroying habitat, have caused sea turtle populations to plummet. In fact, all six species of sea turtles found in U.S. waters are listed as threatened or endangered under the U.S. Endangered Species Act. As we’ve seen in the Gulf of Mexico in recent years, oil spills represent yet another danger for these air-breathing reptiles that rely on clean water and clean beaches. But how exactly do oil spills affect sea turtles? And what do people do during and after an oil spill to look out for the well-being of sea turtles? From the oil itself to the spill response and cleanup activities, a major oil spill has the potential to have serious negative effects on sea turtles. Part of the reason for this is because sea turtles migrate long distances and inhabit so many different parts of the ocean environment at different stages of their lives. For starters, sea turtles hatch (and females later return as adults to lay eggs) on sandy beaches. Then, they head to the vast open ocean where the tiny young turtles drift, hide from predators, and grow among floating islands of seaweed called sargassum. Finally, as larger juveniles and adults, they swim to the shallower waters of the continental shelf and near shore, where they spend the majority of the rest of their lives. If a large offshore spill releases oil into the open ocean, currents and winds can carry oil across all of the habitats where sea turtles are found—and into the potential path of sea turtles of every age—as it makes its way to shore. Another reason sea turtles can be particularly vulnerable to ocean oil spills is simply because they breathe air. Even though sea turtles can hold their breath on dives for extended periods of time, they usually come to the surface to breathe several times an hour. Because most oils float, sea turtles can surface into large oil slicks over and over again. The situation can be even worse for very young sea turtles living among floating sargassum patches, as these small turtles almost never leave the top few feet of water, increasing their exposure to a floating oil slick. Furthermore, ocean currents and winds often bring oil to the same oceanic convergence zones that bring sargassum and young sea turtles together. So, we know the many places sea turtles can run into an oil spill, but how exactly do they encounter the oil during a spill? 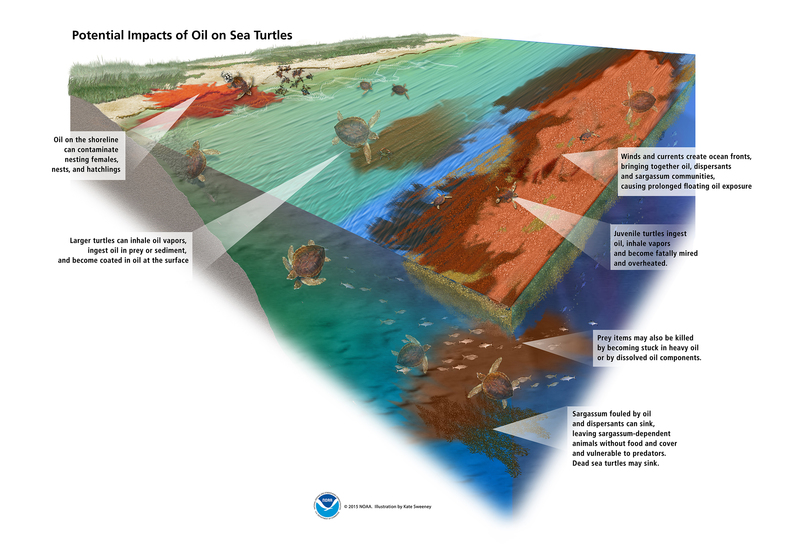 The potential impacts of an oil spill on sea turtles are many and varied. For example, some impacts can result from sea turtles inhaling and ingesting oil, becoming covered in oil to the point of being unable to swim, or losing important habitat or food that is killed or contaminated by oil. (NOAA) Click to view larger. It likely starts when they raise their heads above the water’s surface to breathe. When sea turtles surface in a slick, they can inhale oil and its vapors into their lungs; gulp oil into their mouths, down their throats, and into their digestive tracts while feeding; and become coated in oil, to the point of becoming entirely mired and unable to swim. Similarly, sea turtles may swim through oil drifting in the water column or disturb it in the sediments on the ocean bottom. Female sea turtles that ingest oil can even pass oil compounds on to their developing young, and once laid, the eggs can absorb oil components in the sand through the eggshell, potentially damaging the baby turtle developing inside. Nesting turtles and their hatchlings are also likely to crawl into oil on contaminated beaches. Once sea turtles encounter oil, what are the impacts of that exposure? Inhaling and swallowing oil generally result in negative health effects for animals, as shown in dolphins and other wildlife, hindering their overall health, growth, and survival. Lining the inside of sea turtles’ throats are pointy spines called esophageal papillae, which normally act to keep swallowed food inside while allowing water to be expelled. Unfortunately, these projections also seem to trap thick oil in sea turtles’ throats, and evidence of oil has been detected in the feces of oiled turtles taken into wildlife rehabilitation centers. Oil can irritate sensitive mucus membranes around the eyes, mouth, lungs, and digestive tract of sea turtles, and toxic oil compounds known as polycyclic aromatic hydrocarbons (PAHs) can be absorbed into vital organ tissues such as the lungs and liver. Because sea turtles can hold their breath for long periods, inhaled oil has a greater chance of being absorbed into their bodies. Oil compounds that get passed from mother turtles to their young can interfere with development and threaten the survival of sea turtles still developing in the eggs. Once inside their systems, oil can impede breathing and heart function in sea turtles, which can make diving, feeding, migrating, mating, and escaping predators more difficult. Being heavily covered in oil likewise impedes sea turtles’ abilities to undertake these activities, which puts them at risk of exhaustion and dehydration. In addition, dark oil under a hot summer sun can heat up turtles to dangerous temperatures, further jeopardizing their health and even killing them. In fact, sea turtles heavily coated in oil are not likely to survive without medical attention from humans. Another, less direct way oil spills can affect the health of sea turtles is by killing or contaminating what they eat, which, depending on the species, can range from fish and crabs to jellyfish to seagrass and algae. In addition, if oil kills the sargassum where young sea turtles live, they lose their shelter and source of food and are forced to find suitable habitat elsewhere, which makes them more vulnerable to predators and uses more energy. Spill response and cleanup operations also can harm sea turtles unintentionally. Turtles can be killed after being struck by response vessels or as a result of oil burning and skimming activities. Extra lighting and activity on beaches can disrupt nesting and hatchling turtles, as well as incubating eggs. The harm that oil spills can cause to sea turtles is significant, and estimating the full suite of impacts to these species is a long and complicated process. There are some actions that have been taken to protect these vulnerable marine reptiles during oil spills. Performing rescue operations by boat, which involve scooping turtles out of oil or water using dip-nets and assessing their health. Taking rescued turtles to wildlife rehabilitation centers to be cleaned and cared for. Monitoring beaches and coastlines for injured (and sometimes dead) turtles. Monitoring nesting beaches to safeguard incubating nests. Conducting aerial surveys to assess abundance of adults and large juvenile turtles potentially in the footprint of an oil spill. Finally, the government agencies acting as stewards on behalf of sea turtles, as well as other wildlife and habitats, will undertake a scientific evaluation of an oil spill’s environmental impacts and identify restoration projects that make up for any impacts. 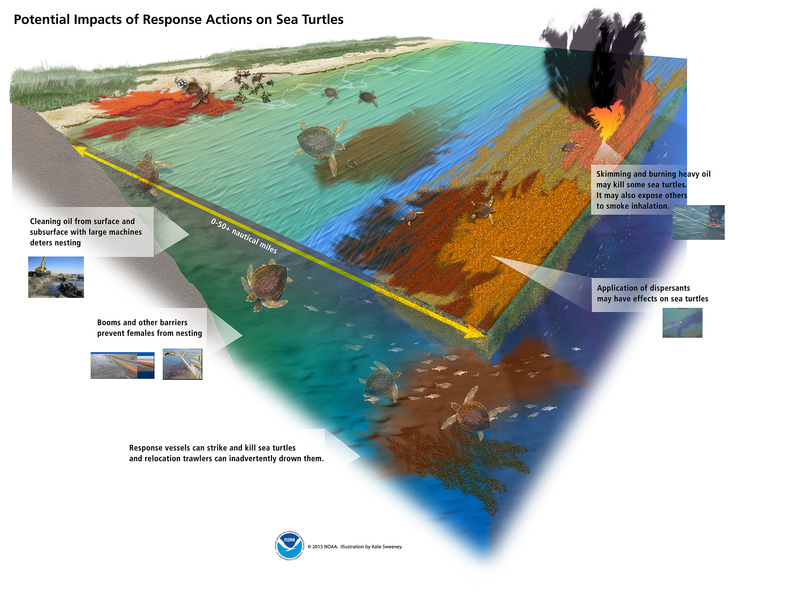 As an example, read about the impacts to sea turtles from the 2010 Deepwater Horizon oil spill, details about how they were harmed, and the proposed restoration path forward.